How can we test a Database that is already on production and online? The answer is database cloning. Database cloning allows to clone a database. This is a writable replica that can be used for testing, development, and is delivered in seconds, with minimal storage consumption. In this article, we will talk about Windocks. This software provides the ability to clone SQL Server databases (also named volume snapshots). 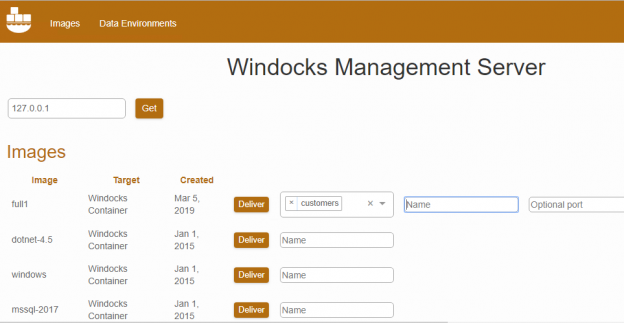 With Windocks you can create clones of your database with minimal disk consumption, and work with the database clones with SQL Server containers or conventional instances. Windocks is a port of of Dockers’s source to Windows used to create SQL Server containers. Docker is mainly Linux based whereas Windocks is specialized in the Windows market. Windocks SQL Server images are based on a local installed instance, which is cloned to deliver a SQL Server container, with support for all editions of SQL Server version starting at SQL Server 2008. Windocks is also a database cloning solution, and supports the creation of clonable database images from storage arrays or SQL Server backups and Windows Virtual Hard Drives (VHDs). Database clones are writable, and are delivered in seconds even for large databases. Windocks supports the delivery of clones to SQL Server containers, as well as SQL Server instances, and even SQL Server Linux containers. What is the difference between an image and a container? Basically, images define what is delivered (based on a Docker file). Images can deliver a SQL Server container, or a SQL container with database cloning, or a database clone that is for use with a SQL Server instance. A SQL Server container is a SQL Server instance. The Windocks containers are handled like SQL Server instances. SQL Server licenses allow for unlimited “instances” created by cloning a licensed installed instance, so Windocks SQL Server containers are “free” under existing MS licenses. Is Windocks part of Docker? No, Windocks is an independent company that ported the Docker source technology for SQL Server Database Cloning. Are the Containers replacing the Virtual Machines? Is Docker replacing the Virtual Machines? Yes and no. Each VM runs a full operating system, which requires CPU and RAM. Containers make it practical to run up to 20 or more containers on a single host. Windocks reports that clients typically use a 4 core machine with 32 GB of RAM to support 20 or more containers. So, most users reduce the use of VMs for dev/test by up to 5-10:1. For testing and development, it is recommended for containers to run on a VM. The scenario is the following. We have a live database in production, but we need to test that live database in different environments. We need to clone the production database for the QA team and for the developers. We have 20 QAs and 30 developers and each one needs a clone of the production database. To have 50 VMs would require many resources and time, so that is why we need a Database cloning software. We need to clone the database easily, automatically, and efficiently. I will not explain all the folders, but just some of them. First of all, the docs folder that contains several pdf and txt documents about installation, licenses, configuration for the database cloning software. If you want the full list of documents you can go to the website documentation. The images and containers are also listed in folders, you can see the list of images and containers in the folders. This file contains names, versions, description and other configuration information. The # is used for comments. The following example is adding the customerdata.mdf (the sample database in Windocks) database to the mssql-2017 image and coping the cleanseData.sql and executing it. If you have errors, the log folder contains the logs with useful information that can provide you deeper details or it can help to the support team. OK, less bla, bla and more action…. Now we will show some useful examples to run the command line. In DevOps it is essential to have a fast automated process for database cloning. This is possible in Windocks using the command line which allows to automate all the process. docker: ‘?’ is not a docker command. See ‘docker ––help’. If you are familiar with Linux, all the configuration files, command lines will be familiar for you. If you are not familiar with Linux, do not worry, this tutorial will help you on that. This will show the list of commands available. This will help you with the synaxis to search images. The following example, will create a container based on the image mssql-2017 and clone the database customers from the backup and copy and run the script named cleanseData.sql. The web app that comes with the installer helps to deliver containers using the UI and without the need of the command line. It is simple to use and intuitive for database cloning. In the textbox type the local IP 127.0.0.1 and press the Get button. The Community Edition does not include user authorization, as shown below. You can set the name, port and password using the web app. Once that your database is cloned, you can use it for testing or development. As you can see, the usage is very simple. In this article, we learned how to clone a database using Windocks. Windocks is a modern technology based on docker that supports both SQL Server containers and database cloning. It is possible to clone SQL Server databases, SSRS and target to any SQL version in Windows or Linux (the supported SQL Server Linux versions). To automate the process, you can use batch files or even PowerShell. We show the command line, so writing your own automated scripts will be a straightforward process. We also learned that the software is simple to use, fast and can help to deliver databases for testing and development efficiently. A Terabyte database cloning can be done in seconds with this new technology and reduces the need of several VMs. It can also work in Azure, Docker containers in Linux with clusters and more.